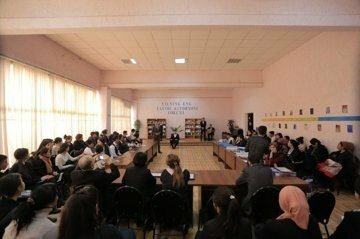 On December 20, 2018, the Forum of the best readers of the year took place in the event hall of the ILC. The event was unveiled this year. At first, the readers entered the symbolic bookstore set up in the ILC. It was as if the readers were entering the book. From December 5 to December 15, with the voluntary consent of the readers who were members of the ILC, they were given a new number from 1 and the participants identified online "successful readers" with participation of objective witnesses on the forum. Shakhrukhhon Gafurov, a resident of Fergana, was recognized as a successful reader. One of the memorable events in the forum is the symbolic reader of 2018. From January 1 to December 20, 201, the ILC has registered 20,000 new readers. Shahzoda Yusupova who was registered as a 20,000th, has been privileged to become a member of the library for 20 years with a special decree. Shokhrukhhon and Shahzoda were awarded prizes by regional press and information department Umidjon Jabbarov and wished them luck. The library has English, German, Korean and Russian readers' clubs. This year, 142 training sessions have been held. A separate leader among the members of the club, each of them discusses the topic in one session and "punished" by mixing words in another language. In other words, they are becoming a student by teaching themselves the best of their own language and passing an online exam to prestigious universities of the world. Ali Yigitaliev, Muhammadali Rasulov, Bahriddin Khakimov, Guzal Isroilovoy, as a "Ready-Up Reader" by ILC, have been awarded by a number of books presented by partners in the forum. We wish success to our readers with their steps towards the threshold of a great life, and we hope that the book will never fall into the hands of the book. Sometimes we ask for some paper documents for our younger readers, according to our guidelines. Such as the consent of their parents or their admission, seem to be a little bit offended by this formalism. Then we go to perfection and, as a rule, "get lost", we accept them as a little reader. They really want to read a book in the library. One of them, Aslbek Ortikov. What makes us happy is young or old readers’ visit to our library. Reading the book by a family member at home and in front of the children is a truly worthwhile experience. We have such great people - our readers. Zumradkhon Aya Sobirova. They do not even condemn the age of 70. Each week, they exchange 3-4 books. It is worth the effort. Munavvar opa Kasimova is the "book-lover" family. They lead their children and choose a book that is suitable for the little ones at home. Javokhir is the pillar of our library. Even in the heat of the summer, in the winter and in the cold and snowy days, he comes to the library. He finds meaning of life in the book. For the past 5 years, he is our most active, loyal reader. May his life will be long. The forum, which has been held in the highest level, was attended by the Youth Union of Uzbekistan, the Liberal Democratic Party of Uzbekistan, the People's Democratic Party of Uzbekistan, the regional councils of the Democratic Party of Uzbekistan "Milliy Tiklanish", Ferghana Regional Association of Consumer Rights Protection Federations, Ferghana Regional Press and Information Administration, “Ferghana book world “. We express sincere gratitude to our friends who supported us.